Free to all, kids and pets welcome! 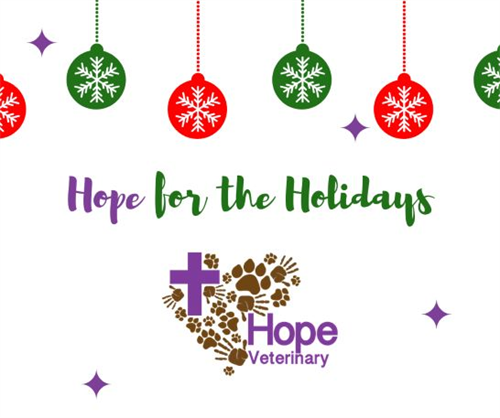 Join Hope Veterinary Care in celebrating the Holidays and giving back to the community. Get family photos(furry kids too) with Mr. and Mrs.Claus by Justin Hurley Photography, decorate a gingerbread man from Treya Lynn's Bakery, get something warm at the Hot Cocoa Bar, make pine cone bird feeders, and more! Donate and we will wrap your presents. Donate winter clothes (especially kids sizes). New or gently used hats, and gloves. Taking an Angel from our tree for the Mary Bryant Home. Any monetary donation with go towards the Hope 12:12 Fund. 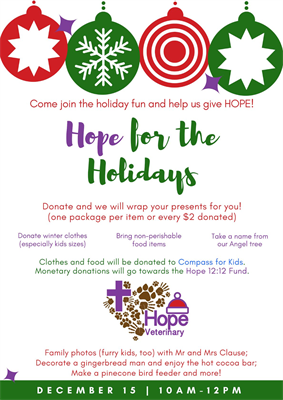 Clothes and food will go to the Compass Kids program.